To anyone with an interest in the development of Rock n Roll and Rhythm n Blues this latest release in AVID Entertainments Essential Collection series truly is essential! We have returned to the U.S.A of the 1920s and 30s to listen to the sound of the Rural Blues. 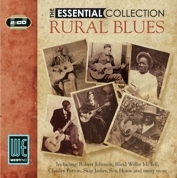 Featuring fifty tracks from fifty different bluesmen this is as fine an introduction to the rural blues as you are likely to find and at such a great price! Avids sound engineers have worked extremely hard and diligently to bring you the best possible sound from these classic old recordings. Our re-mastered double CD will take you on a journey of discovery across the southern states of America to meet such legendary bluesmen as Robert Johnson, Blind Lemon Jefferson, Charley Patton, Blind Blake, Leadbelly, Blind Willie McTell and Son House. The roll call is too extensive to name them all here but rest assured we have covered all the great names and also the not so well known but equally interesting bluesmen like Frank Stokes, Jack Kelly, Henry Thomas, Joe Callicott and Jesse James to name but a few! So pull up your favourite chair and maybe pour yourself a shot or two of whiskey and enjoy the raw and often beautiful sound of the rural blues.